Architecture – the Engineering of Buildings is slowly coming close to earning the reputation it deserved. Indian Architecture has always been a thing of curiosity because of the magnanimity and the artistic creations. It also reflects the influence of the rulers who stamped the country time to time with their power and control. The country has a varied mix of baroques, monuments and modernistic buildings and one can actually pick and pin the buildings as a representation of the era it saw. ‘Globalization is inevitable’ – said Amartya Sen, and architecture of the houses and commercial spaces in the cities of Modern India has reflected this thought in its full glory. Being world-class is one of the changing trends in India Architecture that every architect seems to swear by. British rule had most visible influence on the looks of the cities of India. The rulers of English origin brought the architects from abroad to work upon the buildings of official importance, rail-routes and museums etc. This is the reason there is subtle Victorian look in the buildings that were designed in that era. Indian architecture after Independence could not come out of the influence of the British for longer period of time. Just after independence, the pressure on the town planners was to create more shelter spaces for coping with the sudden influx of the population that happened due to partition. Functional designs, minimalistic approach and houses delivering basic amenities formed the food for thought for the architects on one hand, while the modernistic views of our first Prime Minister Mr. Jawahar Lal Nehru reflected in the buildings where 1% of the cost of development was dedicated to art and sculpture to enhance the aesthetics of the structure. It is an interesting fact that at the time of Independence, India had just 300 architects who needed to cater to the large population of 3 million people belonging to different classes of the society. While the fear of losing the heritage stopped the policy makers from encouraging newer trends, the pomp and show of the Modern architecture continued to cast its spell over the minds of those people who wanted the country to move on with the changing times. 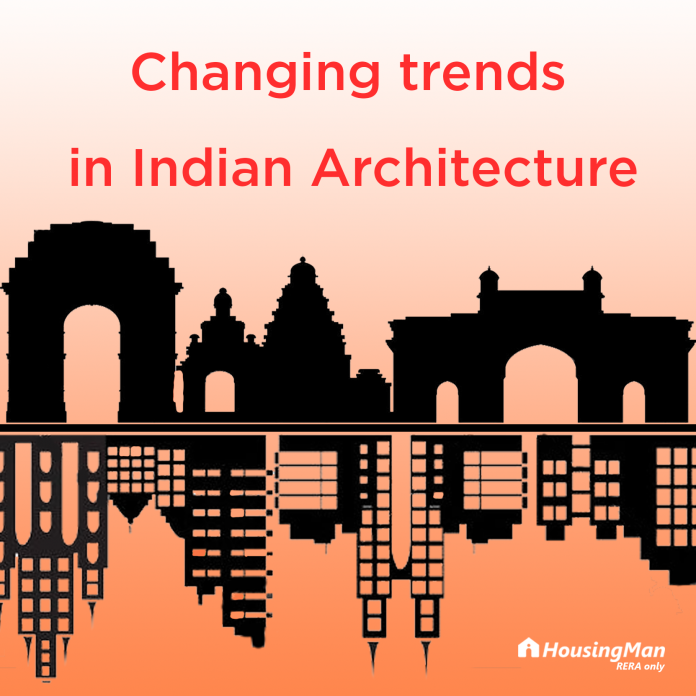 So, the first and most visible impact on Indian architecture after Independence was emerging of the trend where architects came up with designs that were classy amalgamation of traditional royal design and modern aesthetics. India has come far from the era when only traditional designs were the available option for the house seekers. 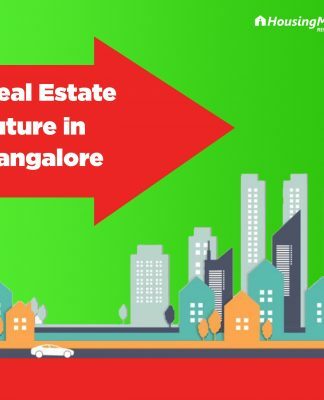 With change in land price and increase in property rates, flat system has penetrated the residential housing architecture and people are seen selling off their lands to buy flats – the representatives of modern, urban living where all the amenities are provided in gated communities. The problem of providing shelter and creating more room out of given space still rules the architectural designs, but the difference is that the designs of today are not only minimalistic, they support the multi-utility feature also. The malls, shopping complexes, commercial establishments and cinema halls have gone a makeover in sync with the emerging global tastes. The previous notion of procuring the material as well as expertise from within the close vicinity has transformed into going for cross-border solutions and picking global trends and integrating as per Indian conditions. 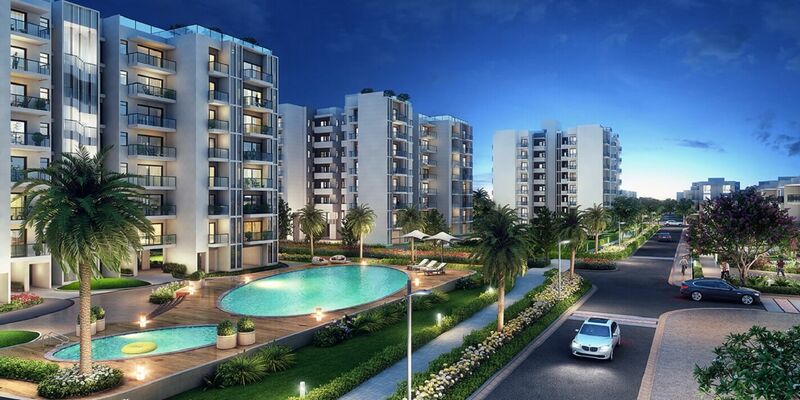 Thus, there is no hesitation among the architects of today in picking the looks from Italy, or US or any other place and converting the buildings into world-class structures yet in lines of Indian housing policies and weather sustainable designs. If we define the changing trends in Indian Architecture more clearly, the connect between the exterior and interior seems to have erased off, completely. Architects put the looks of the building at a higher pedestal then the purpose they are meant to serve. Integrating service with structure is considered the ideal way of bringing the brick and mortar into an adorable edifice. When the first five-year plan was announced in 1952, a whirlwind effect was seen on the architecture. Completing many projects in limited time and resources required the architects to move from the conventional schools of design and bring realistic expression into action. The vision was quite clear as more and more buildings were made future-ready by integrating features such as reduced floor heights, absence of proper ventilation ( to accommodate the air-conditioning feature) etc. Magnificent just got replaced with relevant. 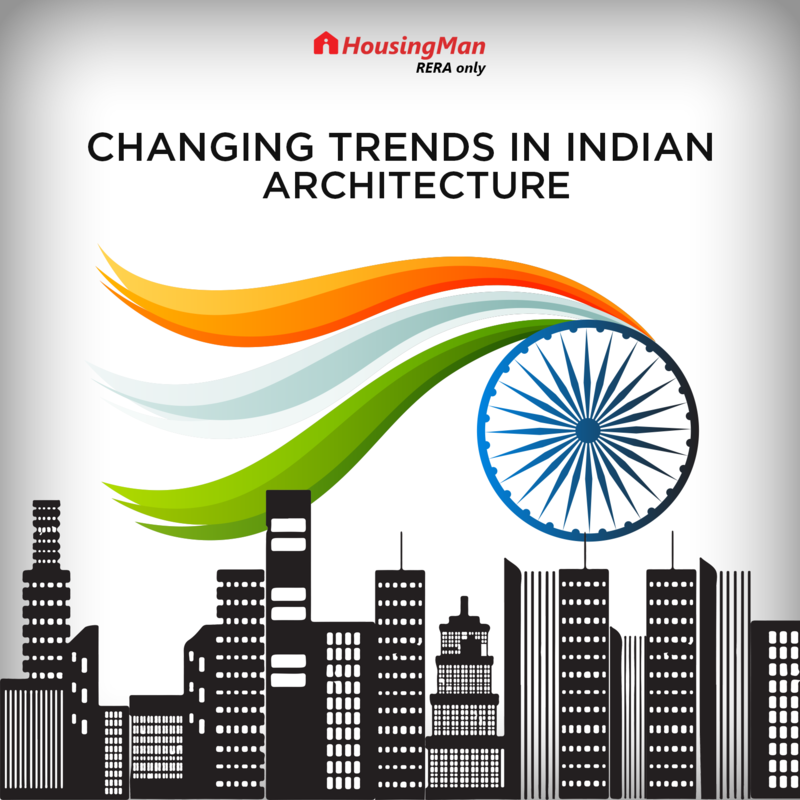 Back to basics seem to be one of the latest trends in Indian Architecture. The spaces are shrinking no doubt; but, the importance of living close to nature is again occupying the centre of thoughts. The definition of modern is no more blindly following the West; what the visionaries have done in the past to use the resources in an optimized manner is also being studied again. Health issues, fast life and pressure to deliver the projects in limited time span is bringing readymade features into the structures, manufacturing components is certainly not the focus; but assembling is. Invisible presence of technology in the structures developed is another trend that is winning attention everywhere. Technology is being embedded deep into the design so that messy look can be given an organized appearance. Geometrical structures and importance of the rectangular shapes of the buildings are other trends from the recommendations of Vaastu experts. The environmental concerns are being taken into account more seriously and so the final form takes the back seat and concepts of insulation, radiations and reflection are brought to the central stage; thus, more than the looks, it is environment-readiness that forms the base of the ideas of the present times. The architect is now required to think only on these lines instead of finding coordination between the exterior and interior. 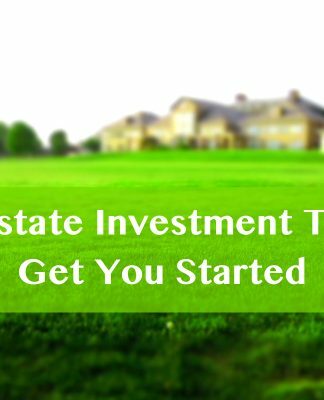 Builders want to get returns on every square feet of land they put on sale in the form of house. 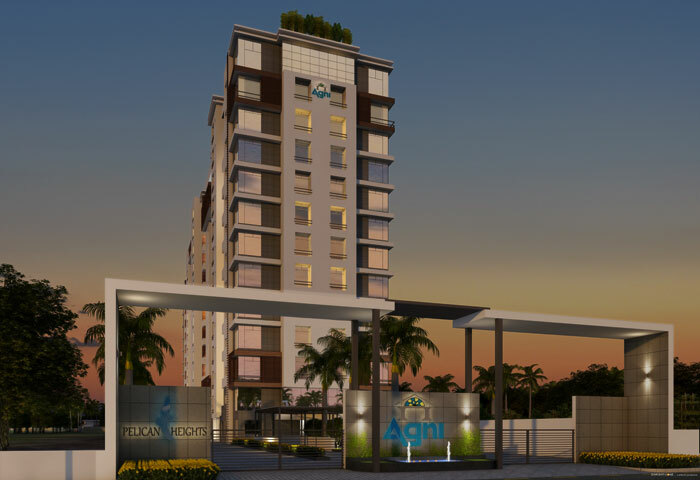 Thus, building voluminous structures that contribute to saleable area feature is one of the latest trends in Indian Architecture. Commercialization is giving way to creativity. Architecture in any country is a mirror of the phase of development it is going through. There is always a need to find sustainability in construction, and to make it capable of coping with the distress that any building is exposed to. The answer can surely be found in heritage buildings that are true salute to the enriched history that put India on the highest pedestal of quality as well as excellence in Arts and Design. How To Cool Your Room Without AC This Summer? How to arrange your home for this Christmas? Home Loan Protection Plan or Pure Term Insurance?